Following a successful PR campaign by the team at Sweaty Betty (think PR Queen Roxy Jacenko), our social media feeds have been more or less saturated by all things Doughnut Time, be it those aqua coloured boxes or brightly decorated goodies, not a day goes by that I don’t see them on my feed. So I decided to head down to their Fitzroy store to see what all the hype is about. The first thing to be said is that the shop, is less like a shop and more like a bright hole in the wall. 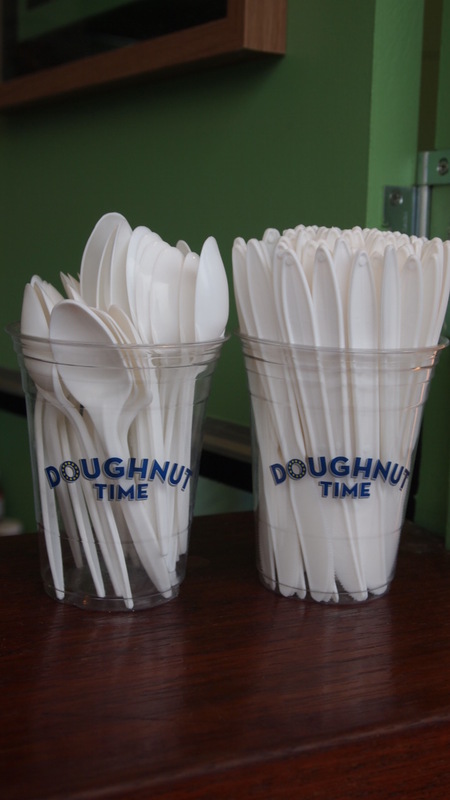 This is definitely not the place you visit if you want a quiet place to sit whilst enjoying a doughnut and coffee. There isn’t even a bench seat at street level, so don’t expect to hang around once you’ve ordered. I made the mistake of visiting with my young son on a miserable rainy Melbourne day, so this was very much a grab and run mission as we tried to stay warm. Having said that, I think it actually played in our favour as there were very few people around (clearly not as willing to brave the rain as we were), so by mid afternoon the little store was still really well stocked and there wasn’t a queue in sight. 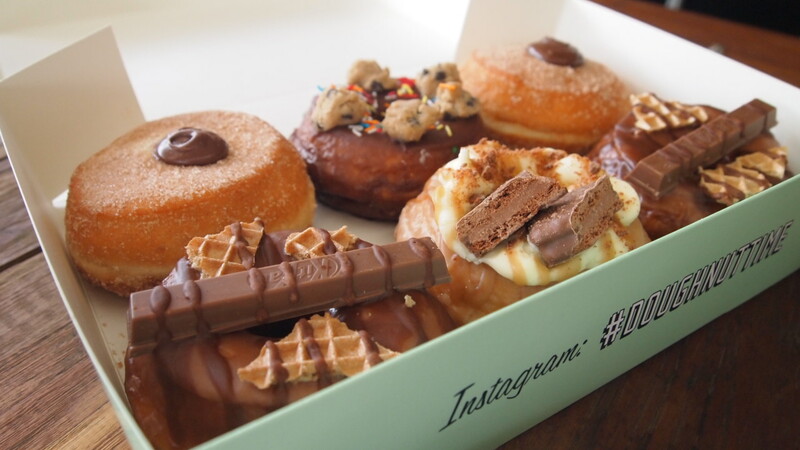 The doughnuts themselves look really impressive. Displayed in the window, they lure in passers by with their bright decorations and array of incredibly tempting unique flavours. 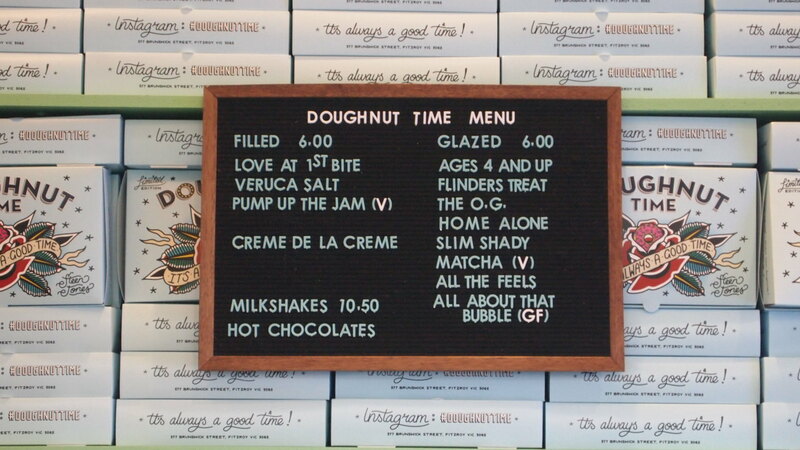 The vast majority of their range is made up of glazed doughnuts, plus a few filled options thrown in for good measure. 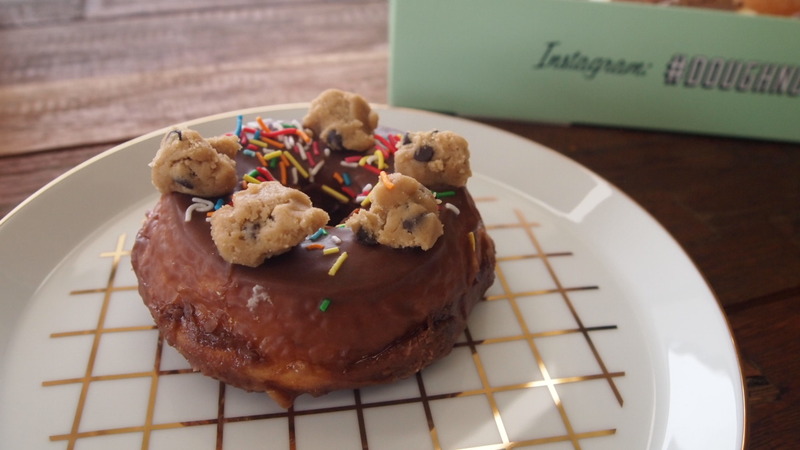 Flavours include ‘All the feels’ (chocolate glaze, topped with sprinkles and large cookie dough pieces), ‘Flinders treat’ (cream cheese amd coffee glaze with tim tam pieces), ‘Home alone’ ( milk chocolate glaze topped with wafers, a kit kat and a dark chocolate drizzle), and what has now become a staple doughnut flavour ‘love at first bite’ which is their take on a nutella filled doughnut. The full list of flavours can be found here, but beware their toppings are regularly updated, so if something catches your eye don’t wait too long to visit. 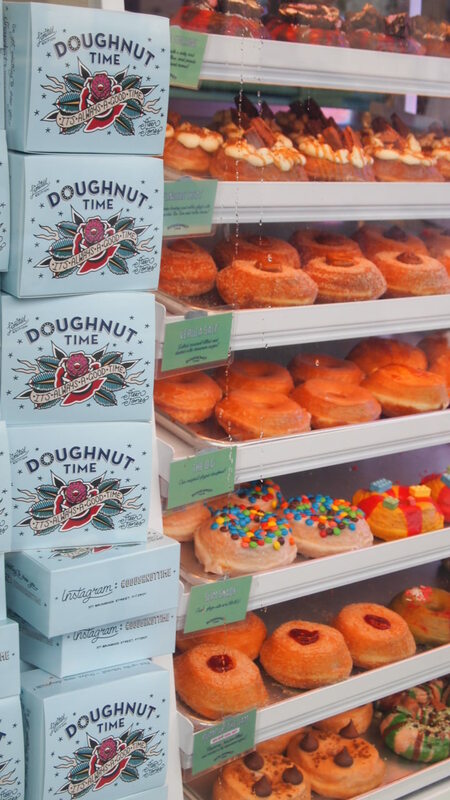 Lets be honest, each doughnut sounds better than the last, so it makes picking just one a very difficult decision, but then why stop at one? Do as I did and opt for a box of 6 amazing flavours. Each doughnut was soft and fluffy, then coated in the most decadent glazes and decorations. I often find that fancy doughnut toppings don’t live up to the expectation, they look great but the flavour isn’t as strong/rich as it should be. This definitely wasn’t the case here, each doughnut tasted just as good as it looked, so much so, I don’t know how you stop at one (aside from the fact that they’re quite a generous size and you’ll probably be full after just the one). Never ever did I think I’d ever say this, but the Nutella doughnut in particular was WAY too rich. I know what you’re thinking, there is no such thing when Nutella is involved, but the doughnut was filled with so much Nutella, it was almost a case of ‘would you like some doughnut with your Nutella?’. I am always down for the worlds best hazelnut spread and am known to eat it out of the jar with a spoon, but I found it to be just a bit much in this doughnut. But really if my biggest criticism is that they didn’t skimp on the Nutella I think they’re onto a winner. Aren’t they just delicious! 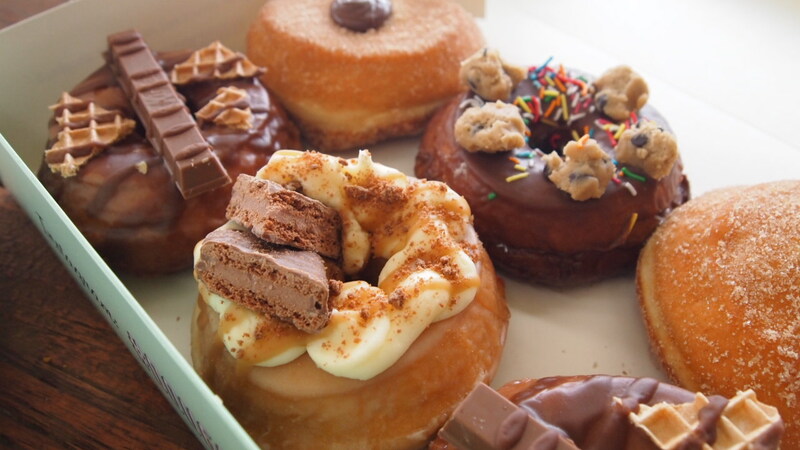 We’ve being going crazy over their decadent doughnuts ever since they opened a couple of years ago. It’s so cool that Short Stop have also arrived in Sydney, now we’re spoilt for choice! Great post!